Agadir Argan Oil Hair Treatment Reviews | Does Agadir Work? As we flit through the years of our lives, it's quite normal to find ourselves unsatisfied with our appearance. Many people decide to take control of their bodies and implement a rigorous physical fitness routine to get in shape, while others overhaul their entire lifestyle in an attempt to dispel bad habits and fortify good ones. While such large changes can be greatly beneficial, it's nice to just do something simple. A change of wardrobe is one way to revitalize your look and image, but a change in hair is also an easy way to make a statement. It's amazing how much a haircut can alter the shape of one's face, and a new color can really help you feel refreshed and empowered for the future. However, it's certainly possible to get a bit overzealous. Does Agadir Argan Oil Hair Treatment Work for Hair Repair? Dying the hair too often can quickly strip the hair shaft of its natural moisture, and the chemicals will break down the integrity of its cellular walls, making your hair brittle, weak and coarse to the touch. This is particularly the case when bleaching the hair from a naturally dark hue to a blonde one. Utilizing styling tools like curling irons, flat irons and hot combs can also cause severe damage to the hair. While preventative measures are the best option, a lot of people are pining to find the miracle treatment that will restore fried hair to its lustrous roots. 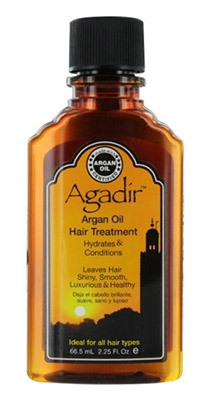 Agadir Argan Oil Hair Treatment is a product that claims to revitalize the health of damaged hair. While it may work sufficiently as a hair conditioner, there doesn't appear to be substantive proof that it can really reverse the signs of damage and weakness in singed hair. Agadir Argan Oil essentially functions like any oil-based product would. It lubricates each hair shaft, effectively separating the threads and offering some protection. Since it contains so much oil, it does have a tendency to feel heavy, so it may be unpleasant if you have particularly fine hair. Hair that is quite naturally oily may also feel greasy when applying this product, so it's best to use very small amounts. While this product may help condition hair and act as a heat protectant, it doesn't appear to offer any results that are miraculous. It won't mend hair that is already damaged. It just helps achieve the illusion of glossier, healthy hair by coating it in a layer that smooths out the rough surface. In order to really revitalize your hair, you'll need to cut back on harsh treatments and consider cutting off dead ends or any hair that is strongly damaged. Maintaining a healthy diet that's rich in nutrients will also strengthen your hair at its core. You can purchase this hair product at a variety of online outlets, including Amazon.com and even popular chains like Target. A perk to this product is that it's relatively inexpensive, so if you decide to try it and dislike it, you won't feel too remorseful. To learn about more effective options for damaged hair, check out the in-depth reviews here.